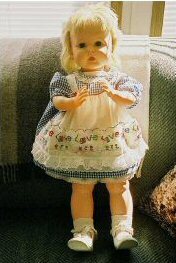 I have separated the section on the large Ruthie-type dolls from the others which were marketed as "Ruthie" as the brand identity changed and there were other influences on them that did not affect the dolls 21" and under. 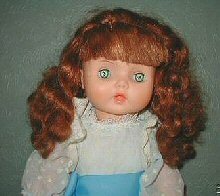 The large Ruthie dolls I have observed being referred to by many names - Ruth's Sister, etc. Unless I can verify with a source I will not use a brand name here. 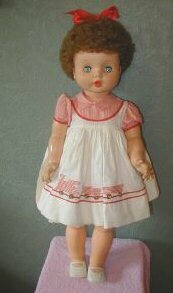 In the first years Ruthie was made (1959-1960) as a vinyl doll she is listed generically with all the other dolls in a 26" tall size. These dolls would share the characteristics of either of the Heavy Vinyl Ruthie dolls, I believe, as the shorter dolls were heavy vinyl in these years. I would LOVE to find one of these, but so far no luck. In 1961, Horsman marketed what seems to the the identical doll under a different brand name - Walk-A-Bye. This is the only year this doll appears in Patiki Gibbs book. The Walk-A-Bye had many hairstyles and original outfits that year. From all that I have been able to determine, these two are similar dolls - face mold, body type, arms etc. except, from handling the 1961 Walkabyes, it is clear they are blow-mold type vinyl, not heavy vinyl. What is a characteristic is the sweet face, and straight moveable arms. The mouth seems slightly open in the face mold, but there is no "bottle mouth" hole. When I get a chance, I'll do a page on the largest Ruthie at 36" who was called Princess Peggy. Ca. 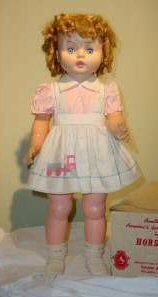 1962-1963, the large Ruthie doll underwent another incarnation - as My Baby & Me. Horsman was making the Thirsty Walker baby dolls and one of them was in exactly the same size. There was only one My Baby & Me style each year thru 1964? - lookit up girl!!! The difference between My Baby & Me and the Walk-A-Bye is the arms - the bottle-holding bent arms are used (to hold the baby of course). The pictures of the face evolve from year to year in the catalogs and book pictures. At first, the face looks very similar to the Walk-A-Bye head. By 1965, the face looks more like a Thirsty Walker without a bottle mouth. I have never seen an identifiable My Baby & Me "in the flesh", but the picture at right looks like it might be one as the mouth looks closed and it has less of a "chipmunk cheek" face than the Thirsty dolls. (one day I'll get a Thirsty Walker pic for comparison - for now the Thirsty Girl is not one of my all time faves, although in the 26-27 inch size the Thirsty Girl was a marketplace queen. 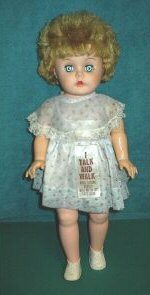 In the 60s, for a time Horsman released a large walking-talking doll at 24 inches in size that had a face that resembles the "classic Ruthie" face. Of course, this was to compete with a marketplace queen of the era - Chatty Cathy. I'd have to read my books & catalogs more carefully to date her more precisely. Obviously I don't care enough about talking dolls yet, as they are usually broken by now.